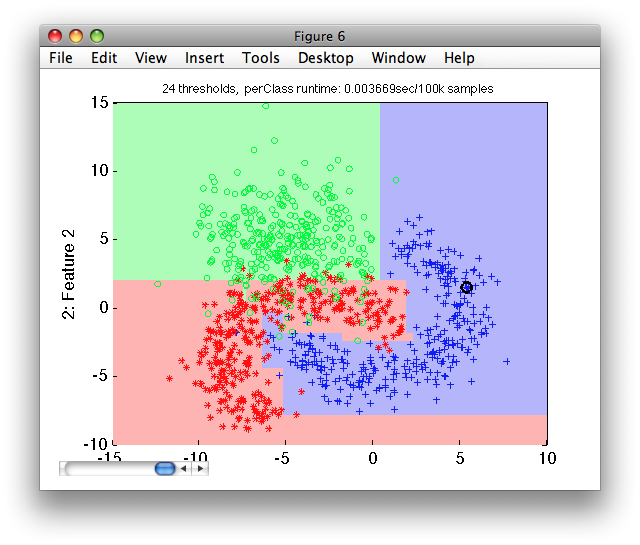 This section describes decision trees and random forest classifiers. perClass sdtree classifier offers a fast and scalable decision tree implementation. Decision tree is build by finding the best threshold on one of the features that improves class separation. The process is applied recursively until the stopping condition is met. If the tree is fully built, each data sample ends in a separate terminal node. This solution, however, does not yield good generalization in case of class overlap. As with other classifiers, perClass strives to provide good solution by default. Therefore, sdtree applies pruning strategy that stops tree growth at the earlier stage. The pruning uses a separate validation set to estimate tree generalization error. To illustrate the basic use of the decision tree, lets consider the fruit_large data set. We split the data to training and test subsets. The test subset will be used later to estimate tree performance. We train the tree on the training subset tr. By default, the data set passed to sdtree is split internally into two subsets. The first part is used to grow the tree and the second part to limit its growth by identifying the sufficient number of thresholds. This process happens inside sdtree. We will see later, how to take closer control over the pruning process. We may suppress the pruning process and grow the full tree, using the 'full' option. Inspecting the pipeline steps, we can see that the number of thresholds and the features used are available for direct query. Note how the number of thresholds is much higher than when pruning the tree. Notice, the over-fitting appearing in the area of overlap. The fully-grown tree solves perfectly separates the training set but fails to do so on the independent test set. We may control the sdtree pruning algorithm in several ways. Firstly, we may specify the fraction of the input data set used for training the tree using the 'trfrac' option. By default, 80% of input data is used to grow the tree and 20% to stop the growth process. Secondly, we may remove the random splitting step by supplying the separate validation data used for pruning. This removes the random element from the sdtree training. Repeating the training, we obtain identical tree. We may also inspect the pruning process in detail. The second output parameter, returned by sdtree, is a structure containing the full tree and the error criterion estimated from the validation set at each tree threshold. The res.full_tree field contains the fully grown tree. To be more precise, it contains the tree grown as much as possible depending on the 'maxsamples' option. By default, at least 10 samples much be present in a node to continue growing process. Decision trees optimize class separability considering all features. Therefore, a trained tree allows us to identify the features that provided most separability in our problem. In other words, we may use it for feature selection. You may see in the pipeline comment, that only 8 features form 10 is used in this tree. Removing the unused features allows us to limit the amount of computation we need in our final system. Random forest classifier sdrandforest combines a large number of specifically-built decision trees. Each tree is built by considering only randomly selected subset of features at each tree node. The combination of their outputs is based on the sum rule. sdrandforest offers several user-adjustable parameters. 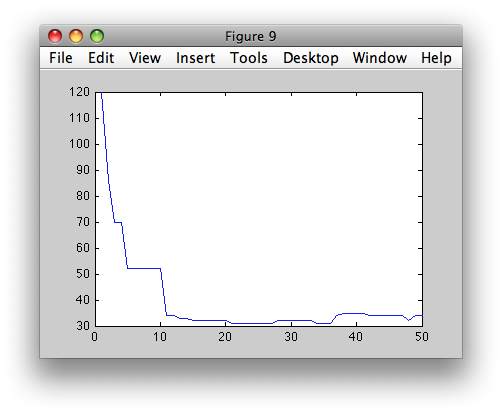 For example, we may alter the number of trees and the number of randomly-selected dimensions.